The EU's chief negotiator has ruled out allowing the UK to collect customs duties on its behalf, a key UK proposal for post-Brexit trade. Michel Barnier said the UK wanted to "take back control" of its money, law and borders - but so did the EU. The EU would not delegate "excises duty collection to a non-member", he said. Both he and UK Brexit Secretary Dominic Raab said progress had been made but "obstacles" remained before reaching a deal in October. Mr Raab said: "We have agreed to meet again in mid-August and then to continue weekly discussions to clear away all the obstacles that line our path, to a strong deal in October - one that works for both sides." Laura Kuenssberg: What now for the government? He replaced David Davis, who quit as Brexit secretary in protest at Theresa May's plans for a future economic relationship between the UK and EU, as set out in the White Paper. That set out in more detail the government's proposed customs system, the Facilitated Customs Arrangement for goods and agri-foods. The UK's plan involves it collecting some EU tariffs - in a bid to ensure frictionless trade in goods and to avoid a hard border in Northern Ireland. Michel Barnier wants the UK to make a choice. If it wants to have frictionless trade with the EU's single market then it will have to join a customs union, or something like it, which will mean applying the EU's tariffs and reducing the scope for doing free trade deals with others. If it wants more freedom, it will have to agree arrangements with the EU that will reduce friction but not eliminate it altogether. It's an old tune that sounds different after the publication of the UK's White Paper, which was supposed to have solved this dilemma. It also sounds like the UK will propose a revamped version of its idea for avoiding a hard border between the Republic of Ireland and Northern Ireland but the two sides are still divided on whether that should have a time-limit or not. Lost among all of this will be the nugget of good news: Big strides have been made on security co-operation after Brexit. But Mr Barnier said retaining control of the money, law and borders also applied to the EU's customs policy. "The EU cannot and the EU will not delegate the application of its customs policy and rules and VAT and excises duty collection to a non-member who would not be subject to the EU's governance structures," he said. Any customs arrangement or union "must respect this principle", he said. BBC assistant political editor Norman Smith said Mr Barnier appeared to have delivered a significant blow to Mrs May's controversial proposals, which have already been criticised by pro-Brexit Tory MPs. 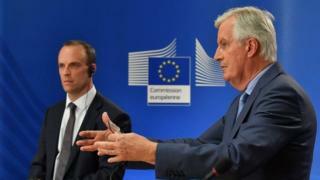 Speaking after talks with Mr Raab, Mr Barnier said that Theresa May's Brexit White Paper plan was a "real step forward". He highlighted agreement on security measures and said both sides wanted a wide-ranging free trade deal. But he added: "To be frank, we are not at the end of the road yet." While UK proposals on security marked "a real step forward" and he welcomed the acknowledgement that the European Court of Justice was the only arbiter of EU law, he added: "In contrast, on our future economic relationship, it comes as no surprise that finding common ground between the EU27 and the UK is more difficult." Brexit Secretary Mr Raab said the UK proposals had been designed "to respect the result of the referendum, and the core principles of the EU". "We have considered the innovative approaches the EU has taken in the past with other third countries - when the political will has been there," he said. "In sum, the UK has set out our plans in detail. Those plans are ambitious, principled and pragmatic. I am committed to injecting new energy into these talks, along with Michel." Turning to Mr Barnier, he said: "Michel, we have work to do." Barnier agrees with everyone that it is guff. So UK faces either humiliating climbdown or humiliating economic disaster. Labour MP Ben Bradshaw, who is part of the People's Vote campaign for a vote on any final Brexit deal, said: "The White Paper is dead. It has expired. It has ceased to be." For the Liberal Democrats, Christine Jardine said the prime minister's White Paper was "struggling to survive" .